“All Aboard,” crowed the conductor. My husband Rick and I jauntily moved with the crowd toward the coaches. We sank down into comfy window seats. 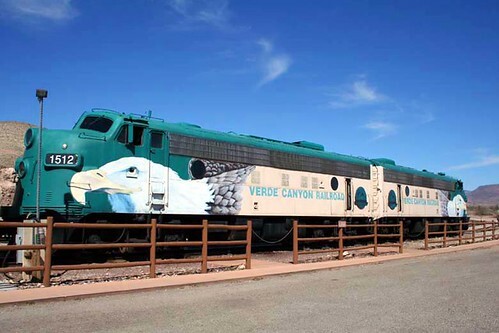 The powerful eagle-decaled engines of the Verde Canyon Train rolled smoothly out of the Clarkdale Station for a four-hour round trip to Perkinsville Ranch – through a wilderness that can only be seen from these rails. Towering sentinels of black slag sided the tracks as we left the station. A vivid reminder that this line was built in 1912 to haul copper ore from the Clarkdale Smelter to the main Santa Fe line, for shipping to markets throughout the country. It also shuttled workers and supplies to the once thriving mining town of Jerome, until the two area mines closed in 1953. Descending into what is known as “the other Grand Canyon” a panorama of crimson cliffs rose in breathtaking splendour. My breath caught as we overlooked a steep drop to where rapidly flowing rivers and creeks snaked between Cottonwood and Sycamore trees. Rounding a bend everyone in our car shouted “turtle” as this distinguishable form jutted out from the rock face. An angel, a lizard and an elephant were other shapes sculpted by nature’s artistry. Passing the Sinagua Indian cliff dwellings (dating back to 600AD) I pondered their way of life in such a lofty domain. “She’ll be coming ‘round the mountain when she comes” and other nostalgic rail ditties bubbled over the train’s sound system. Irresistible aromas had us set down our cameras for a time to partake in zesty snacks and a refreshing margarita. “In a few minutes you will see the nest of Black and Decker, our long-time resident eagle couple.” This announcement sent us scurrying to an open-air viewing car with cameras poised. We were not disappointed; one of the pair was sitting in the high cliff roost with their new fuzzy off-spring; the other winged beauty was soaring towards them carrying a riparian lunch in its claws. Over trestle bridges and through a 680-foot manmade tunnel we rolled into Perkinsville – population 2 (not counting the few penned cows). Being handy to a limestone quarry, the railroad once used the Perkins’ ranch as a loading station for this crucial smelting element – with no objection from Mr. P who could then ship his cattle directly from the ranch. The engines were maneuvered along a side-track to the opposite end of the train for the return to Clarkdale and for us to catch sights missed on the way out. After wandering through gift shops with old-time facades, we zeroed in on the Wood’N West Gallery. Amazingly detailed western settings filled with miniature moveable figures were the work of master wood carver, Jack Britt. Hopping on a mini-train for a rumble around the grounds, a large treed area loomed with charred trunks visible in between flourishing new growth. Engineer Guss informed us, “The ‘Blazin’ in the ranch name stems from a fire that raged through the ranch in 1992 – and the ‘M’ stands for the Maybery family, owners and operators of the ranch since 1966.” A few years after the fire the family decided to sell off the cattle and take on providing frolicking evenings for guests. We dived into a heap’o’beans, BBQ chicken and beef, baked potato, apple sauce, spice cake and…. ohhhhh, oven-fresh biscuits. Knowing one biscuit would never suffice, cowpokes cruised the isles with loaded baskets. While chomping on the last morsel of one, all we had to do was raise a hand and catch another that came flying through the air. Our coffee sloshed in our cups as we stomped and clapped to the Blazin’M Cowboys (one being 80-year-old Grandpa Maybery) who belted out vintage tunes to the strains of guitar, banjo, and keyboard. Comical banter had us rolling with laughter, especially when “Otis” appeared in his dungarees and toothless grin to share his backwoods philosophy of life. We left with an irrepressible chuckle at some theatrical surprises, and as such my lips are sealed – but guaranteed, they are a bolt out of the blue. It had been a grand day of living the history of the old west. Swathed in the same stunning beauty of the Verde Canyon as the ancient tribes, miners and pioneers, the cliffs reverberated with imagined and documented tales of the past. And needless to say, with the cowboy hospitality and hilarity at the Blazin’M – we did not see a single person retrieve their frown from the bucket on their way out.